Our proprietorship firm, Clock Win Equipments, established in 1995, is ISO 9001:2008 certified company and a renowned manufacturer, supplier, exporter, wholesaler and retailer of Rivets and Riveting Tools in the market. Blind Rivets, Riveting Tools and Pop Rivets are the products widely accepted and appreciated by the customers. We always strive to please our customers with accurate production and supply. For the same reason, we have recruited design engineers with excel knowledge and incomparable skills to ensure the consumers their desired product. Besides this, our products are so finely produced that very low or no maintenance is required for them and they are extremely durable. In addition, they are produced in different dimensions and styles to attract consumers and are corrosion and abrasion free. 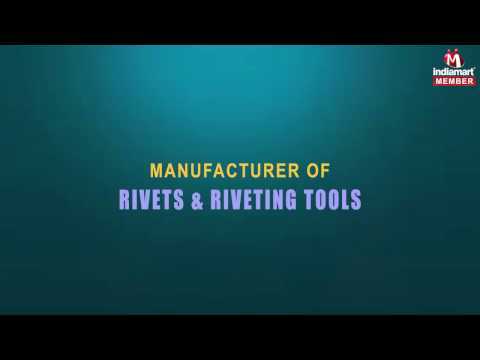 All these features of our product make us an imperative dealer of rivets in the respected industry.